For the wide receiver born in 1978, see Antonio Brown (wide receiver, born 1978). Antonio Tavaris Brown Sr. (born July 10, 1988) is an American football wide receiver for the Oakland Raiders of the National Football League (NFL). Raised in Liberty City, Miami, Brown attended Miami Norland High School where he played both football and track. He played college football at Central Michigan University, where he earned All-American honors in 2008 and 2009 as a punt returner. A sixth round pick by the Pittsburgh Steelers in 2010, no player has amassed more receptions and receiving yards than Brown since he entered the league. During his first season with the Steelers, the team advanced to Super Bowl XLV, but lost to the Green Bay Packers. He finished his rookie season with 16 receptions for 167 yards in ten games. During his second season, Brown became the first player in NFL history to have more than 1,000 yards receiving and returning in the same year. For his efforts, Brown was selected as a punt returner for the 2012 Pro Bowl. In 2013, Brown became the only receiver in NFL history to record five receptions and at least 50 yards in every single game of an NFL season. 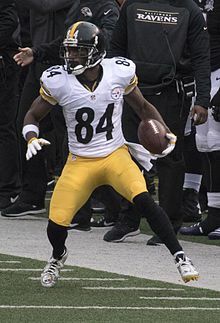 Although his on-the-field productivity continued over the next several seasons, including leading the league in receiving yards in 2014 and 2017, Brown's relationship with the Steelers, especially with quarterback Ben Roethlisberger, soured and in 2019 he requested a trade from the Steelers. He was eventually dealt to Oakland, who then made him the highest-paid receiver in the league. Brown is the son of retired Arena Football League star Eddie Brown; in 2006, the league named Eddie Brown the best player in its history. His father played wide receiver for the Albany Firebirds and collegiate football for Louisiana Tech. Brown attended Miami Norland High School in Miami, Florida, where he was a two-sport athlete in both football and track. In football, Brown played running back, quarterback, wide receiver, and punt returner for the Vikings. He was a two-time Class 6A all-state selection and was also named North Athlete of the Year at 2005 Miami-Dade Gridiron Classic. In track & field, Brown was a two-time state qualifier in the 100-meter dash, and also ran the fourth leg on the Norland 4 × 100 m relay squad, helping them capture the state title at 41.50 seconds. He spent a prep year in 2006 at North Carolina Tech. Coming out of high school, Brown applied to Florida State University. His admission was denied over academic concerns. After attempting to attend Alcorn State, he decided to enroll at North Carolina Tech Prep. Playing in just five games at quarterback, Brown passed for 1,247 yards and 11 touchdowns, while rushing for 451 yards and 13 touchdowns. Once he finished his lone season at North Carolina Tech Prep, he received a scholarship to play at Florida International University, but he was expelled before the season for an altercation with security. Brown then began reaching out to wide receivers coach Butch Jones at West Virginia, since he had been highly recruited by him. After learning that Jones had left West Virginia to become the head coach at Central Michigan, Brown enrolled at the school and started his college football career as a walk-on freshman. Brown attended and played college football for Central Michigan from 2007–2009. Brown began attending Central Michigan in 2007 after wide receivers coach Zach Azzanni told him he could fly to Michigan and try out for the team as a walk-on wide receiver. Transitioning from the quarterback position in high school to wide receiver in college was not that difficult for him, and after a few weeks, Central Michigan coaches offered him a scholarship. Brown had difficulty adjusting to the college lifestyle, and being on time for meetings and practice. Azzanni and his wife helped him get situated and into an established routine, and he soon became like a part of their family. During his first season at Central Michigan, Brown played in 14 games. He played well enough to win the Mid-American Conference Freshman of the Year and was All-Conference as a returner. For his freshman season, he had 102 receptions for 1,003 yards and six touchdowns. His 102 receptions led the Mid-American Conference in 2007. Brown started every game during his sophomore season in 2008. Against Temple, he had three receptions for 33 yards and a season-high two touchdown receptions. The next week, against Western Michigan, he had 10 receptions for 113 yards and threw a two-yard touchdown pass in the third quarter. On November 28, while playing at Eastern Michigan, he had seven receptions for a season-high 172 yards and a touchdown. For the season, Brown hauled in 93 receptions for 998 yards and seven touchdowns. His 410 punt return yards and 791 kick return yards that season led the conference. In his junior season against Akron on September 26, 2009, Brown had nine receptions for 89 yards and a season-high two touchdowns against the Zips. For the 2009 season, he had five games with over 100 receiving yards. In his last regular season game on January 6, 2010, against Troy, Brown had a season-high 13 receptions for 178 yards. He finished 2009 with single-season bests of 110 receptions (also a school record), 1,198 receiving yards, and nine touchdowns. For his career at Central Michigan, he had a school-record 305 receptions, (including the top three seasons with the most receptions in school history), 3,199 receiving yards (fourth all-time), and 22 touchdowns (third all-time). On January 7, 2010, he announced he would forgo his senior season and enter the 2010 NFL Draft. On January 7, 2010, Brown announced that he would forgo his senior season and enter the 2010 NFL Draft. Coming out of Central Michigan, the majority of analysts and scouts projected Brown to be a fifth or sixth round draft selection. He was ranked as the 37th best wide receiver by NFLDraftScout.com and was invited to the NFL combine, where he completed the entire workout and all the positional drills. Brown participated at Central Michigan's Pro Day and decided to try to improve on his 10, 20, and 40-yard dash times after being unsatisfied with the numbers he clocked at the combine. He was able to lower his time in all three categories. Using a pick received in a trade with the Arizona Cardinals, the Pittsburgh Steelers selected him in the sixth round (195th overall) in the 2010 NFL Draft. He was the 22nd of 27 wide receivers selected in the draft, and the second by the Pittsburgh Steelers behind Emmanuel Sanders. He picked the jersey number 84, which he explained: "Eight times four is 32. Thirty-two teams looked past me, even the Steelers. So every time I go out there it’s a little added motivation." On June 15, 2010, the Pittsburgh Steelers signed Brown to a three-year, $1.28 million contract with a signing bonus of $73,075. He entered training camp competing with Emmanuel Sanders, Tyler Grisham, Stefan Logan, Isaiah Williams, and Brandon Logan to be the Steelers' backup wide receivers. Brown was named the Steelers' fifth wide receiver on their depth chart, behind veterans Hines Ward, Mike Wallace, Antwaan Randle El, and Arnaz Battle. On September 19, 2010, Brown made his regular season debut against the Tennessee Titans and returned two kicks and a punt for 128 yards, including an 89-yard touchdown from a reverse on the first play of the game. On October 3, 2010, Brown made his first career catch for a six-yard gain during a 17–14 loss to the Baltimore Ravens. During a Week 17 contest against the Cleveland Browns, Brown made a season-high four catches for 52 yards in a 41–9 victory. He finished his rookie season with 16 receptions for 167 yards in ten games. The Steelers finished the 2010 season with a 12–4 record and finished first in the AFC North. On January 15, 2011, Brown appeared in his first postseason game and caught a 58-yard pass on 3rd & 19 from Ben Roethlisberger to set up the game-winning touchdown. He finished his first playoff game with a season-high 75 yards on three receptions as the Steelers defeated the Baltimore Ravens in the AFC Divisional Round by a score of 31–24. The following week in the AFC Championship against the New York Jets, at the two-minute warning, Brown caught a 14-yard pass on 3rd & 6, sealing the 24–19 victory for the Steelers and advancing them to the Super Bowl. On February 6, 2011, he appeared in his first Super Bowl. He handled four kickoff returns, four punt returns, and finished with one catch for a one-yard gain in the 31–25 Super Bowl XLV loss to the Green Bay Packers. Brown entered training camp competing with Emmanuel Sanders, Arnaz Battle, Limas Sweed, and Jerricho Cotchery to be the Steelers' third wide receiver after the departure of Antwaan Randle El. He won the competition and was named the third wide receiver on the depth chart behind Hines Ward and Mike Wallace. Brown was also named the starting kick returner and punt returner. Brown made his first appearance of the season in the Steelers' season-opener against the Baltimore Ravens and finished with two receptions for 14 yards and had three kickoff returns for 34 yards in a 35–7 loss. On October 30, 2011, Brown had a season-high nine receptions for 67 yards and caught his first career touchdown reception on a seven-yard pass from Ben Roethlisberger in a 25–17 victory over the New England Patriots. The next game, he caught five passes for 109 yards, marking his first career game with over 100 receiving yards, in a 23–20 loss to the Baltimore Ravens. On November 13, 2011, he earned his first career start and made five receptions for 86 yards in a 24–17 defeat of the Cincinnati Bengals. On December 4, 2011, he returned a punt for a 60-yard touchdown and made two catches for 67 yards, as the Steelers routed the Cincinnati Bengals 35–7. The punt return for a touchdown was the first in his career and Brown was named AFC Special Teams Player of the Week for his performance. In a Week 14 win over the Cleveland Browns, he made his second start of the season and ended the game with five catches for a season-high 151-yards and scored a season-long 79-yard touchdown in a 14–3 victory. He finished the season with 69 receptions for 1,108 yards and two touchdown receptions in 16 games and three starts. The Pittsburgh Steelers finished 12–4 and received a playoff berth. On January 8, 2012, Brown caught five passes for 70 yards and had one carry for 18 yards in a 29–23 overtime loss to the Denver Broncos in the AFC Wild Card Round. Brown became the first player in NFL history to have more than 1,000 yards receiving and returning in the same year. For his efforts, Brown was selected as a punt returner for the 2012 Pro Bowl. On January 29, 2012, Brown appeared in his first career Pro Bowl and caught two passes for 15 yards, helping the AFC defeat the NFC 59–41. On July 28, 2012, the Pittsburgh Steelers signed Brown to a five-year, $42.5 million extension that included an $8.5 million signing bonus. With the retirement of Hines Ward during the off season, Brown entered training camp competing with Mike Wallace and Emmanuel Sanders to be the starting wide receivers. Brown and Wallace were subsequently named the starters at the position to begin the regular season. In the Steelers' season opener against the Denver Broncos, Brown finished the 31–19 loss with four receptions for 74 yards and had one carry for four yards. On September 23, 2012, Brown had seven receptions for 87 yards and a touchdown, while also making his first touchdown reception of the season on an 11-yard pass from Ben Roethlisberger in a 34–31 loss at the Oakland Raiders. On November 4, 2012, Brown was fined $10,000 by the NFL for unsportsmanlike conduct when he ran backwards for the final 20 yards of a punt return touchdown against the Washington Redskins the previous week. The following game, Brown suffered a high ankle sprain and left the game with two catches for 19 yards in a 24–20 victory over the New York Giants. The ankle injury prevented him from appearing in the next three games. In a Week 15 matchup with the Dallas Cowboys, he made a season-high eight catches for 76 yards and a touchdown in a 27–24 loss. The following week, Brown caught five passes for a season-high 97 yards and scored a 60-yard touchdown in a 13–10 loss to the Cincinnati Bengals. He finished the 2012 season with 66 receptions for 787 yards and five touchdowns in 13 games and ten starts. Brown entered the 2013 regular season as one of the Steelers' starting wide receivers with Emmanuel Sanders. The team had been unable to reach a contract agreement with former starter Mike Wallace in the offseason, and he left for the Miami Dolphins via free agency. Brown started the Steelers' season opener against the Tennessee Titans and had five receptions for 71 yards in a 16–9 loss. On September 22, 2013, Brown caught nine passes for a season-high and then career-high 196 yards and two touchdowns in a 40–23 loss to the Chicago Bears. His first touchdown reception of the season came on a 33-yard pass from Ben Roethlisberger. The following game, he caught a season-high 12 passes for 88 yards in a 34–27 loss to the Minnesota Vikings. On December 22, 2013, Brown broke Yancey Thigpen's single-season team record of 1,398 receiving yards set in 1997. Brown also became only the second Steeler to amass at least 100 receptions in a season, joining former teammate Hines Ward. On December 29, he, along with Pierre Garçon of the Washington Redskins, tied Jimmy Smith as the only players to record at least five receptions in every single game of an NFL season in a win against the Browns. In addition, Brown became the only receiver in NFL history to record five receptions and at least 50 yards in every single game of an NFL season. He finished the 2013 season with a total of 110 receptions for 1,499 yards and eight touchdowns in 16 games and 14 starts. On December 27, 2013, Brown was selected for the Pro Bowl as a receiver and a punt returner. On January 3, 2014, Brown was named to the AP All-Pro team for the first time in his career. He was ranked 23rd by his fellow players on the NFL Top 100 Players of 2014. In the Steelers' season opener against the Cleveland Browns, while returning a punt, Brown attempted to hurdle Cleveland Browns punter Spencer Lanning and kicked him in the facemask, garnering significant media attention. He finished the 30–27 victory with five receptions for 116 yards and later apologized for the kick, claiming it was an accident. On September 11, 2014, Brown was fined $8,200 for kicking the punter. On October 20, 2014, against the Houston Texans, Brown threw his first career touchdown pass, a three-yard strike to wide receiver Lance Moore. The following game, Brown caught ten passes for 133 yards and two touchdowns in a 51–34 victory over the Indianapolis Colts. During a Week 9 contest against the Baltimore Ravens, Brown made a season-high 11 catches for a season-high 144 yards, including a 54-yard touchdown reception in the 43–23 victory. In Week 17, against the Cincinnati Bengals, he had seven receptions for 128 yards and a touchdown to go along with a 71-yard punt return touchdown. His successful performance earned him AFC Special Teams Player of the Week. In 2014, Brown led the NFL in receptions (129), receiving yards (1,698), and was tied for second in touchdowns (13); all three were new team records. The Steelers made the playoffs and faced off against the Baltimore Ravens in the Wild Card Round. In the 30–17 loss, he had nine receptions for 117 yards. His successful season garnered him a third Pro Bowl selection. He was ranked eighth by his fellow players on the NFL Top 100 Players of 2015. Brown started in the Steelers' season-opening 28–21 loss to the New England Patriots and caught nine passes for 133 yards and a touchdown. The following week, he had nine receptions for 195 yards and a touchdown, as the Steelers routed the San Francisco 49ers 43–18. This brought his career total to 5,587 yards, good for 200th on the NFL's all-time receiving yards list. He also moved past Steelers' legend Lynn Swann on the all-time list. In Week 3, Brown had 108 receiving yards on 11 catches in the 12–6 victory over the St. Louis Rams. Brown remained first on the receiving yards list through Week 4, although he had only five receptions for 42 yards in the 23–20 loss to the Baltimore Ravens. On November 8, 2015, Brown caught a career-high 17 passes from Roethlisberger for a career-high 284 yards in a 38–35 win over the Oakland Raiders. His 284 receiving yards broke Keenan McCardell's mark of 232 in 1996 for most receiving yards in a game without a receiving touchdown. On December 6, he hauled in eight passes for 118 yards and two touchdowns in a 45–10 victory over the Indianapolis Colts. This game is particularly notable for a play in which Brown returned a punt for a touchdown and then proceeded to leap onto the goalpost. He was flagged on the play for excessive celebration. On December 9, Brown was fined $11,576 by the NFL for the incident. For his efforts against the Colts, he earned his third career AFC Special Teams Player of the Week Award. In a Week 15 matchup with the Denver Broncos, he caught 16 passes for 189 yards and two touchdowns in a 34–27 victory. For his performance against the Broncos, he was named as the AFC Offensive Player of the Week. On January 3, 2016, Brown totaled 13 receptions for 187 yards and a touchdown against the Cleveland Browns. He finished the regular season with a league-high 136 receptions for 1,834 yards and 10 touchdowns – the first two marks eclipsing his own team records of 129 catches and 1,698 yards. With the 136 receptions, he set two NFL records: most receptions in a two-year span with 265; and most receptions in a three-year span with 375. Also, with his 16 receptions against the Browns, Brown became the first receiver to post two 16+ catch games in a single season, and his four games of 175+ yards in a season also set a new NFL record. The Steelers opened postseason play with a Wild Card game against the Cincinnati Bengals, and late in the fourth quarter, Brown left the contest with a concussion after taking a hit from Bengals linebacker Vontaze Burfict. The Steelers went on to win the game, 18–16. The injury kept Brown out of the Steelers' next game in the Divisional Round, where they lost 23–16 to the eventual Super Bowl 50 champion Denver Broncos. Brown was named to his third consecutive and fourth career Pro Bowl, his second first-team All-Pro, and was ranked as the top wide receiver and the fourth best player on the NFL Top 100 Players of 2016. Brown started the Steelers' season opener against the Washington Redskins and finished the 38–16 victory with eight receptions for 126 yards and two touchdowns. After the game, the NFL fined him a combined $15,191 for wearing baby blue cleats, which violated the league's uniform policy, and for twerking after scoring his second touchdown. After performing a similar dance in the end zone in Week 4 against the Kansas City Chiefs, Brown was fined $24,309. The second fine was largely criticized by sportswriters, who considered it much too steep a penalty for a celebration. The league reasoned that the dances were "sexually suggestive". In Week 3, Brown moved into the NFL top 100 all-time for career receptions, and in Week 9, he joined the top 100 for career receiving yards. In Week 10, Brown caught a season-high 14 passes for a season-high 154 yards and a touchdown in a 35–30 loss to the Dallas Cowboys. In Week 12, he finished with five receptions for 91 yards and a season-high and career-high three touchdown receptions, as the Steelers routed the Indianapolis Colts 28–7 on Thanksgiving. He finished the regular season with a total of 106 receptions (second to Larry Fitzgerald) for 1,284 yards and 12 touchdowns in 15 games and 15 starts. The Steelers decided to sit him for the season finale against the Cleveland Browns as they had already clinched a playoff berth. With the conclusion of the 2016 regular season, Brown ranked second in career receptions and third in career receiving yards for the Steelers, and 57th and 78th all-time among NFL players in those categories. In the 2016 season, Brown posted his fourth consecutive and fifth career 1,000+ yard season in receiving yards, earning him his fourth consecutive and fifth career Pro Bowl selection on December 20, 2016. He was also named First Team All-Pro for the third consecutive time. He was also ranked fourth by his peers on the NFL Top 100 Players of 2017. On January 8, 2017, Brown caught five passes for 124 yards and two touchdowns in a 30–12 home victory over the Miami Dolphins in their AFC Wild Card Round game. His two touchdowns of 50 and 62 yards were the first time since 2001 that a player had caught two 50+ yard touchdowns in a single post-season game, the first time ever in the first quarter, and the first time a Steeler had two receiving touchdowns in a Wild Card game. 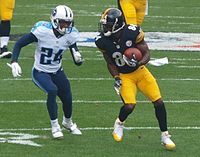 In the Divisional Round, Brown caught six passes for 108 yards in an 18–16 win over the Chiefs, becoming the third Steeler with four or more 100-yard receiving playoff games. After the game, Brown broadcast the team's locker room celebration on Facebook Live in violation of NFL rules and despite the requests of teammates Ben Roethlisberger and Ramon Foster to "keep a low profile on social media". The broadcast included head coach Mike Tomlin speaking crudely about championship round opponent New England, for which Tomlin later apologized and disciplined Brown. Brown had been paid $244,000 by Facebook before the season to "create content" for live channels. In the AFC Championship against the Patriots, Brown had seven receptions for 77 yards as the Steelers lost 36–17. For his accomplishments in the 2017 season, he was ranked fourth on the NFL Top 100 Players of 2017. On February 27, 2017, Brown signed a new five-year contract with the Steelers through the 2021 season. The contract is a four-year extension worth $68 million ($19 million guaranteed at signing) with a $17 million annual price tag, making Brown the highest paid wide receiver in the NFL. During Week 1 against the Cleveland Browns, Brown posted a performance with 182 receiving yards on 11 receptions as the Steelers won a close game 21–18. Brown's 182 receiving yards led all NFL receivers for the season opening week. In addition, Brown converted all 11 of his targets, which marked a career-high in terms of receptions with a 100% completion rate. During Thursday Night Football against the Tennessee Titans in Week 11, Brown made a one-handed catch adjacent to his helmet in the endzone for a touchdown. Overall, he made 10 receptions for 144 receiving yards and three touchdowns as the Steelers won 40–17, joining John Stallworth as the only Steelers player with two career games with 3+ receiving touchdowns. For his performance in Week 11, Brown was named AFC Offensive Player of the Week. During Sunday Night Football against the Green Bay Packers in Week 12, Brown recorded 169 receiving yards and 2 touchdowns, including two sideline receptions for 37 yards in the final 17 seconds to set up the game-winning field goal. He became the fifth player since the 1970 merger with four 150+ yard receiving games in the first 12 weeks of a season. Plagued with a minor toe injury, During Sunday Night Football against the Ravens in Week 14, Brown finished with a season-high 213 receiving yards, helping the Steelers win 39–38 and clinch a playoff berth for the AFC North pennant. His 213-yard performance marked the second time in his career with at least 200 receiving yards in a single game. During Week 15 against the New England Patriots, Brown left the game with a left calf injury, and was taken to the hospital. Shortly after the Steelers' 27–24 loss to the AFC East-clinching Patriots, it was revealed that Brown's left calf was partially torn, meaning that he would not play for the rest of the regular season, but would at least return during the playoffs. He returned in the Divisional Round of the playoffs, recording seven catches for 132 yards and two touchdowns as the Steelers went on to lose 45–42 to the Jaguars. Brown finished the 2017 season leading the league with 1,533 receiving yards for the second time in his career. He also finished fifth in the league with 101 receptions and tied for fourth in the league with nine touchdown receptions. He was named to his sixth Pro Bowl, and was named first-team All-Pro as a unanimous selection. He was ranked the second best player, as well as the best wide receiver, on the NFL Top 100 Players of 2018. On September 9, 2018, in the season opener against the Cleveland Browns, Brown reached 10,000 career receiving yards in the 21–21 tie. He achieved the milestone in 116 career games, and only one NFL player (Calvin Johnson in 115 games) had reached the mark in fewer career games. In the game, Brown had nine catches for 93 yards and a touchdown. In Week 5 against the Atlanta Falcons, Brown had six catches for 101 yards and two touchdowns in the 41–17 victory. In Week 6 against the Cincinnati Bengals, Brown had five catches for 105 yards and caught the game-winning touchdown with 10 seconds left in the fourth quarter. Brown was also a victim of a dirty hit from Vontaze Burfict in the game. In Week 11, against the Jacksonville Jaguars, he had five receptions for 117 yards and a touchdown in the narrow 20–16 victory. In Week 13, on NBC Sunday Night Football, he had 10 receptions for 154 yards and a touchdown in the 33–30 loss to the Los Angeles Chargers on NBC Sunday Night Football. During Week 16 against the New Orleans Saints, Brown finished with 185 receiving yards and two touchdowns as the Steelers lost 28–31. Overall, Brown finished the 2018 season with 168 receptions for 1,297 and a career-high 15 touchdowns. After allegedly getting into an argument with quarterback Ben Roethlisberger, then skipping practices leading up to the week 17 game against the Cincinnati Bengals, Brown was benched for that game. Following the season, reports surfaced indicating Brown's dissatisfaction with his role on the Steelers, and he eventually requested a trade. On March 9, 2019, the Steelers agreed to trade Brown to the Oakland Raiders in exchange for a third- and a fifth-round selection in the 2019 NFL Draft. The deal became official on March 13, 2019. Brown has fathered five children with three different women. In 2018, Brown was featured in recording artist Drake's music video for "God's Plan". On July 18, 2018, Brown was announced as the cover athlete for Madden NFL 19. On March 8, 2016, Brown was announced as one of the celebrities who competed on season 22 of Dancing with the Stars. He was paired with professional dancer Sharna Burgess. Brown and Burgess were eliminated during the semifinals of the show and finished the competition in fourth place overall. On January 3, 2019, Brown took part on the first season of the American version of The Masked Singer. He competed in the show wearing "The Hippo" costume and sang "My Prerogative" by Bobby Brown before being eliminated in the first episode. ^ "Antonio at 30: How Brown stacks up against Rice, what's next". ESPN.com. July 10, 2018. Retrieved December 6, 2018. ^ "'Touchdown' Eddie Brown tops Arena top 20 list". ESPN. January 19, 2006. ^ Fowler, Jeremy (January 25, 2016). "'Touchdown' Eddie Brown amazed at son Antonio's brilliance". ESPN. ^ McPherson, Jordan. "South Florida's deep connection to the NFL playoffs runs through high school football". Miami Herald. Retrieved February 25, 2018. ^ "Steelers Antonio Brown posts video of his High School highlights". 24/7 Sports. Retrieved November 9, 2017. ^ "Pittsburgh Steelers: Antonio Brown". ^ Bernreuter, Hugh. "Antonio Brown Does Almost Everything for Central Michigan". MLive.com. ^ a b "Pittsburgh Steeler's Antonio Brown, Central Michigan walk-on, Dreamed of days like this". Detroit Free Press. ^ DeArdo, Bryan. "Steelers Antonio Brown posts video of his High School highlights". CBSSports.com. Retrieved November 14, 2017. ^ Kimes, Mina. "After a decade apart, Antonio Brown and TY Hilton's unlikely bond". ESPN.com. Retrieved November 21, 2015. ^ Bernreuter, Hugh. "Antonio Brown Does Everything for Central Michigan". MLive.com. ^ "Antonio Brown College Stats". College Football at Sports-Reference.com. Retrieved February 25, 2018. ^ Meyer, Craig. "Antonio Brown, Dapper Dan Sportsman of the Year again, continues to work". Pittsburgh Post-Gazette. Retrieved November 9, 2017. ^ a b c "Rivals.com: Antonio Brown Stats". ^ "2007 Mid-American Conference Leaders". College Football at Sports-Reference.com. Retrieved February 25, 2018. ^ "Temple at Central Michigan Box Score, October 11, 2008". College Football at Sports-Reference.com. Retrieved November 9, 2017. ^ "Western Michigan at Central Michigan Box Score, October 18, 2008". College Football at Sports-Reference.com. Retrieved November 13, 2017. ^ "Central Michigan at Eastern Michigan Box Score, November 28, 2008". College Football at Sports-Reference.com. Retrieved November 9, 2017. ^ "2008 Mid-American Conference Leaders". College Football at Sports-Reference.com. Retrieved February 25, 2018. ^ "Akron at Central Michigan Box Score, September 26, 2009". College Football at Sports-Reference.com. Retrieved November 9, 2017. ^ "Antonio Brown 2009 Game Log". College Football at Sports-Reference.com. Retrieved November 9, 2017. ^ "GMAC Bowl – Troy vs Central Michigan Box Score, January 6, 2010". College Football at Sports-Reference.com. Retrieved November 9, 2017. ^ "Central Michigan Media Guide" (PDF). CSTV.com. Retrieved January 9, 2017. ^ "Antonio Brown to Enter NFL Draft". Scout.com. ^ Schad, Joe. "Central Michigan Chippewas WR Antonio Brown to enter NFL draft". ESPN.com. ^ "*Antonio Brown, DS #37 WR, Central Michigan: 2010 NFL Draft". nfldraftscout.com. Retrieved January 10, 2017. ^ Bernreuter, Hugh (April 22, 2010). "Central Michigan University's Dan LeFevour, Antonio Brown, and Bryan Anderson ready for the draft". mlive.com. Retrieved January 10, 2017. ^ "*Antonio Brown – Central Michigan, WR : 2010 NFL Draft Scout Player Profile". ^ "2010 NFL Draft Listing". Pro-Football-Reference.com. Retrieved November 4, 2017. ^ "2010 NFL Draft Listing". Pro-Football-Reference.com. Retrieved February 25, 2018. ^ "Sportrac.com: Antonio Brown contract". sportrac.com. Retrieved January 10, 2017. ^ "Ourlads.com: Pittsburgh Steeler's Depth Chart: 07/31/2010". ourlads.com. Retrieved January 10, 2017. ^ "Ourlads.com: Pittsburgh Steeler's Depth Chart: 09/05/2010". ourlads.com. Retrieved January 10, 2017. ^ "Pittsburgh Steelers at Tennessee Titans – September 19th, 2010". Pro-Football-Reference.com. Retrieved November 9, 2017. ^ "Baltimore Ravens at Pittsburgh Steelers – October 3rd, 2010". Pro-Football-Reference.com. Retrieved November 9, 2017. ^ "Pittsburgh Steelers at Cleveland Browns – January 2nd, 2011". Pro-Football-Reference.com. Retrieved November 9, 2017. ^ "Antonio Brown 2010 Game Log". Pro-Football-Reference.com. Retrieved November 9, 2017. ^ "2010 Pittsburgh Steelers Statistics & Players". Pro-Football-Reference.com. Retrieved November 9, 2017. ^ "Divisional Round – Baltimore Ravens at Pittsburgh Steelers – January 15th, 2011". Pro-Football-Reference.com. Retrieved November 9, 2017. ^ "AFC Championship – New York Jets at Pittsburgh Steelers – January 23rd, 2011". Pro-Football-Reference.com. Retrieved November 9, 2017. ^ a b c d e f g "NFL Player Profile: Antonio Brown". NFL.com. Retrieved January 10, 2017. ^ "Super Bowl XLV – Pittsburgh Steelers vs. Green Bay Packers – February 6th, 2011". Pro-Football-Reference.com. Retrieved November 15, 2017. ^ "Ourlads.com: Pittsburgh Steeler's Depth Chart: 09/04/2011". ourlads.com. Retrieved January 10, 2017. ^ "NFL Game Center: Week 1–2011: Pittsburgh Steelers @ Baltimore Ravens". nfl.com. Retrieved January 10, 2017. ^ "NFL Game Center: Week 8-2011: New England Patriots @ Pittsburgh Steelers". NFL.com. Retrieved January 10, 2017. ^ "Baltimore Ravens at Pittsburgh Steelers – November 6th, 2011". Pro-Football-Reference.com. Retrieved November 9, 2017. ^ "Pittsburgh Steelers at Cincinnati Bengals – November 13th, 2011". Pro-Football-Reference.com. Retrieved November 9, 2017. ^ "Cincinnati Bengals at Pittsburgh Steelers – December 4th, 2011". Pro-Football-Reference.com. Retrieved November 9, 2017. ^ "2011 NFL Week 13 Leaders & Scores". Pro-Football-Reference.com. Retrieved February 25, 2018. ^ "Cleveland Browns at Pittsburgh Steelers – December 8th, 2011". Pro-Football-Reference.com. Retrieved November 9, 2017. ^ "Wild Card – Pittsburgh Steelers at Denver Broncos – January 8th, 2012". Pro-Football-Reference.com. Retrieved November 9, 2017. ^ "NFC Nationals vs. AFC Americans – Box Score – January 29, 2012". www.foxsports.com. Retrieved February 26, 2018. ^ Florio, Mike (July 27, 2012). "Steelers ink Antonio Brown to long-term deal". Pro Football Talk. NBC Sports. Archived from the original on March 28, 2014. Retrieved March 28, 2014. ^ "Ourlads.com: Pittsburgh Steeler's Depth Chart: 09/01/2012". ourlads.com. Retrieved January 10, 2017. ^ "Pittsburgh Steelers at Denver Broncos – September 9th, 2012". Pro-Football-Reference.com. Retrieved November 9, 2017. ^ "NFL Game Center: Week 3-2012: Pittsburgh Steelers @ Oakland Raiders". NFL.com. Retrieved January 10, 2017. ^ "League fines Pittsburgh Steelers' Antonio Brown $10K". NFL.com. National Football League. November 4, 2012. Archived from the original on March 28, 2014. Retrieved November 4, 2012. ^ "Pittsburgh Steelers at New York Giants – November 4th, 2012". Pro-Football-Reference.com. Retrieved November 9, 2017. ^ Söze, Michael (November 6, 2012). "Antonio Brown injury: Steeler's WR sprains ankle, likely to miss Chief's game". inquisitr.com. Retrieved January 10, 2017. ^ "Pittsburgh Steelers at Dallas Cowboys – December 16th, 2012". Pro-Football-Reference.com. Retrieved November 9, 2017. ^ "Cleveland Browns at Pittsburgh Steelers – December 30th, 2012". Pro-Football-Reference.com. Retrieved November 9, 2017. ^ "Antonio Brown 2012 Game Log". Pro-Football-Reference.com. Retrieved November 9, 2017. ^ "Ourlads.com: Pittsburgh Steeler's depth chart". ourlads.com. Retrieved January 10, 2017. ^ "Tennessee Titans at Pittsburgh Steelers – September 8th, 2013". Pro-Football-Reference.com. Retrieved November 9, 2017. ^ "Chicago Bears at Pittsburgh Steelers – September 22nd, 2013". Pro-Football-Reference.com. Retrieved February 26, 2018. ^ "NFL Game Center: Week 3-2013: Chicago Bears @ Pittsburgh Steelers". NFL.com. Retrieved January 10, 2017. ^ "Pittsburgh Steelers at Minnesota Vikings – September 29th, 2013". Pro-Football-Reference.com. Retrieved February 26, 2018. ^ "Pittsburgh Steelers Single-Season Receiving Leaders". Pro-Football-Reference.com. Retrieved February 25, 2018. ^ "Pittsburgh Steelers Single-Season Receiving Leaders". Pro-Football-Reference.com. Retrieved November 9, 2017. ^ Marczi, Matthew (December 29, 2013). "Antonio Brown Becomes First Player Ever With 5 Receptions, 50 Yards In Every Game – Steelers Depot". Steelers Depot. Retrieved November 9, 2017. ^ "2013 NFL Pro Bowlers". Pro-Football-Reference.com. Retrieved February 25, 2018. ^ "2014 NFL All-Pros". Pro-Football-Reference.com. Retrieved February 25, 2018. ^ "2014 NFL Top 100". Pro-Football-Reference.com. Retrieved February 25, 2018. ^ "'Top 100 Players of 2014': Antonio Brown". NFL.com. Retrieved February 25, 2018. ^ Brown, Scott. "Antonio Brown jump-kicks punter". ESPN.com. ^ "Cleveland Browns at Pittsburgh Steelers – September 7th, 2014". Pro-Football-Reference.com. Retrieved February 26, 2018. ^ "Steelers WR Antonio Brown penalized for kicking Browns' punter in face". SI.com. ^ "Houston Texans at Pittsburgh Steelers – October 20th, 2014". Pro-Football-Reference.com. Retrieved November 9, 2017. ^ "Indianapolis Colts at Pittsburgh Steelers – October 26th, 2014". Pro-Football-Reference.com. Retrieved November 9, 2017. ^ "Cincinnati Bengals at Pittsburgh Steelers – December 28th, 2014". Pro-Football-Reference.com. Retrieved February 25, 2018. ^ "2014 NFL Week 17 Leaders & Scores". Pro-Football-Reference.com. Retrieved February 25, 2018. ^ "2014 NFL Receiving". Pro-Football-Reference.com. Retrieved December 26, 2017. ^ "2014 NFL Standings & Team Stats". Pro-Football-Reference.com. Retrieved February 25, 2018. ^ "Wild Card – Baltimore Ravens at Pittsburgh Steelers – January 3rd, 2015". Pro-Football-Reference.com. Retrieved February 25, 2018. ^ "2014 NFL Pro Bowlers". Pro-Football-Reference.com. Retrieved February 25, 2018. ^ "2015 NFL Top 100". Pro-Football-Reference.com. Retrieved February 25, 2018. ^ "'Top 100 Players of 2015': No. 8 Antonio Brown". NFL.com. Retrieved February 25, 2018. ^ "Pittsburgh Steelers at New England Patriots – September 10th, 2015". Pro-Football-Reference.com. Retrieved November 9, 2017. ^ "San Francisco 49ers at Pittsburgh Steelers – September 20th, 2015". Pro-Football-Reference.com. Retrieved November 9, 2017. ^ "Pittsburgh Steelers at St. Louis Rams – September 27th, 2015". Pro-Football-Reference.com. Retrieved November 9, 2017. ^ "Baltimore Ravens at Pittsburgh Steelers – October 1st, 2015". Pro-Football-Reference.com. Retrieved November 9, 2017. ^ "2015 NFL Receiving Through Week 4". Pro-Football-Reference.com. Retrieved February 26, 2018. ^ "Oakland Raiders at Pittsburgh Steelers – November 8th, 2015". Pro-Football-Reference.com. Retrieved November 9, 2017. ^ "Indianapolis Colts at Pittsburgh Steelers – December 6th, 2015". Pro-Football-Reference.com. Retrieved November 9, 2017. ^ "Antonio Brown fined for touchdown celebration with goalpost". Sports Illustrated. December 9, 2015. Retrieved October 9, 2016. ^ "2015 NFL Week 13 Leaders & Scores". Pro-Football-Reference.com. Retrieved February 25, 2018. ^ "Denver Broncos at Pittsburgh Steelers – December 20th, 2015". Pro-Football-Reference.com. Retrieved November 9, 2017. ^ "2015 NFL Week 15 Leaders & Scores". Pro-Football-Reference.com. Retrieved February 25, 2018. ^ "Wild Card – Pittsburgh Steelers at Cincinnati Bengals – January 9th, 2016". Pro-Football-Reference.com. Retrieved November 9, 2017. ^ "Divisional Round – Pittsburgh Steelers at Denver Broncos – January 17th, 2016". Pro-Football-Reference.com. Retrieved November 9, 2017. ^ "2015 NFL Pro Bowlers". Pro-Football-Reference.com. Retrieved February 25, 2018. ^ "2015 NFL All-Pros". Pro-Football-Reference.com. Retrieved February 25, 2018. ^ "'Top 100 Players of 2016': No. 4 Antonio Brown". NFL.com. ^ "Pittsburgh Steelers at Washington Redskins – September 12th, 2016". Pro-Football-Reference.com. Retrieved November 9, 2017. ^ Fowler, Jeremy (September 15, 2016). "Antonio Brown on fines for TD twerk, cleats: 'Nothing to a boss'". ABC News. Retrieved October 9, 2016. ^ "Antonio Brown fined $9,115 for twerking in end zone". Sports Illustrated. September 16, 2016. Retrieved October 9, 2016. ^ a b Roth, Dan (October 6, 2016). "Antonio Brown's twerk celebration draws $24,000 fine". The Washington Post. Retrieved October 9, 2016. ^ Wilder, Charlotte (October 7, 2016). "Don't stop twerking, Antonio Brown". USA Today. Retrieved October 9, 2016. ^ Brinson, Will (October 7, 2016). "Antonio Brown draws a ridiculously large fine for his latest end-zone twerk". CBS Sports. Retrieved October 9, 2016. ^ "Pittsburgh Steelers' Antonio Brown fined again for TD celebration". The Sports Xchange. United Press International. October 6, 2016. Retrieved October 9, 2016. ^ "NFL Receptions Career Leaders". Pro-Football-Reference.com. Retrieved November 9, 2017. ^ "Dallas Cowboys at Pittsburgh Steelers – November 13th, 2016". Pro-Football-Reference.com. Retrieved November 9, 2017. ^ "Pittsburgh Steelers at Indianapolis Colts – November 24th, 2016". Pro-Football-Reference.com. Retrieved November 9, 2017. ^ "2016 NFL Receiving". Pro-Football-Reference.com. Retrieved November 9, 2017. ^ "Three rookies, Matt Ryan among players named to All-Pro team". NFL.com. January 6, 2017. ^ "NFL Game Center: Week 18-2016: Miami Dolphins @ Pittsburgh Steelers". NFL.com. Retrieved January 9, 2017. ^ Fowler, Jeremy (January 8, 2017). "Steelers WR Antonio Brown scores two touchdowns on first two drives of game". ESPN.com. . Note that Jacoby Jones caught a 56 yard touchdown pass and returned a kickoff 108 yards in 2013. ^ Ricky Sanders is the only player to do so in the second quarter (in 1988), Wayne Millner is the only player in the third quarter (in 1938). ^ Brown is one of four Steelers with two receiving touchdowns in a playoff game. The 124 yards was also a Steeler record for a Wild Card game, and tied for fourth best in any Pittsburgh playoff game. ^ The others are Hines Ward with four and John Stallworth with five. Brown also joined three other Steelers for the most 100-yard playoff games in a single postseason with two. ^ Smith, Michael David (January 18, 2017). "Antonio Brown: "I absolutely regret the Facebook Live situation"". NBC Sports. Retrieved January 19, 2017. ^ Seetharaman, Deepa; Perlberg, Steven (July 19, 2016). "Facebook to Pay Internet Stars for Live Video". Wall Street Journal. ^ "AFC Championship – Pittsburgh Steelers at New England Patriots – January 22nd, 2017". Pro-Football-Reference.com. Retrieved November 9, 2017. ^ "2017 NFL Top 100". Pro-Football-Reference.com. Retrieved February 25, 2018. ^ "'Top 100 Players of 2017': No. 4 Pittsburgh Steelers wide receiver Antonio Brown". NFL.com. Retrieved February 25, 2018. ^ Varley, Teresa (February 27, 2017). "Brown signed to a new five-year contract". Steelers.com. Retrieved March 8, 2019. ^ Sessler, Marc (February 27, 2017). "Steelers sign Antonio Brown to new five-year deal". NFL.com. Retrieved March 8, 2019. ^ "Antonio Brown puts Steelers back in business in season opener against Browns". The Times Online. Retrieved September 10, 2017. ^ "Week 1 Receiving Results". Pro-Football-Reference.com. Retrieved February 26, 2018. ^ "Antonio Brown Career Game Log". Pro-Football-Reference.com. Retrieved October 6, 2017. ^ Wesseling, Chris (November 17, 2017). "Antonio Brown, Steelers romp to victory over Titans". NFL. Retrieved November 17, 2017. ^ "Social media reacts to Antonio Brown's amazing catch". NFL. Retrieved November 17, 2017. ^ Lam, Quang M. (November 22, 2017). "Antonio Brown, Mark Ingram among Players of Week". NFL.com. Retrieved March 8, 2019. ^ "Green Bay Packers at Pittsburgh Steelers – November 26th, 2017". Pro-Football-Reference.com. ^ "Baltimore Ravens at Pittsburgh Steelers – December 10th, 2017". Pro-Football-Reference.com. Retrieved December 15, 2017. ^ Wilson, Ryan. "Ravens vs. Steelers score, highlights: Big Ben leads comeback with career night". CBSSports.com. Retrieved December 20, 2017. ^ Bergman, Jeremy (December 17, 2017). "Antonio Brown out with partially torn calf at least until playoffs". NFL. Retrieved December 17, 2017. ^ "Divisional Round – Jacksonville Jaguars at Pittsburgh Steelers – January 14th, 2018". Pro-Football-Reference.com. Retrieved February 25, 2018. ^ "2017 NFL Receiving". Pro-Football-Reference.com. Retrieved February 25, 2018. ^ Patra, Kevin (January 5, 2018). "All-Pro Team: Antonio Brown is unanimous selection". NFL.com. Retrieved January 22, 2018. ^ "'Top 100 Players of 2018': Pittsburgh Steelers wide receiver Antonio Brown". Retrieved October 31, 2018. ^ Marczi, Matthew (September 9, 2018). "Antonio Brown Becomes 2nd-Fastest Player To 10,000 Receiving Yards". Steelers Depot. Retrieved September 20, 2018. ^ Chiappelli, Kirstie (September 9, 2018). "Steelers, Browns tie in wet 'n' wild OT thriller". Sporting News. Retrieved October 31, 2018. ^ "Antonio Brown scores twice as Steelers roll past reeling Falcons". USA TODAY. Associated Press. October 7, 2018. Retrieved October 31, 2018. ^ Edholm, Eric (October 14, 2018). "Steelers foil Bengals again, this time with late TD from Antonio Brown". Pro Football Weekly. Retrieved October 31, 2018. ^ Joseph, Andrew (October 14, 2018). "Vontaze Burfict takes cheap shot at Antonio Brown's head". USA TODAY. Retrieved October 31, 2018. ^ Gorman, Kevin (November 19, 2018). "Steelers wide receivers win war of words with Jaguars corners". triblive.com. Retrieved December 6, 2018. ^ Fowler, Jeremy (December 27, 2018). "Antonio Brown and JuJu Smith-Schuster hit historic milestone". ESPN.com. Retrieved January 22, 2019. ^ Williams, Charean (December 31, 2018). "Report: Antonio Brown missed game for disciplinary reasons, not injury". ProFootballTalk. Retrieved February 2, 2019. ^ Dubin, Jared (February 12, 2019). "Antonio Brown goes public with his desire to leave Pittsburgh: 'Time to move on'". CBSSports.com. Retrieved February 28, 2019. ^ "Raiders acquire All-Pro wide receiver Antonio Brown". Raiders.com. March 13, 2019. ^ Adams, Jonathan (November 8, 2018). "Antonio Brown's Kids: How Many Children Does Steelers WR Have?". Heavy.com. Retrieved March 8, 2019. ^ Heck, Jordan (February 16, 2016). "The story behind Antonio Brown's cameo in Drake's 'God's Plan' music video". Sporting News. Retrieved September 27, 2018. ^ Fowler, Jeremy (July 18, 2018). "Steelers receiver Antonio Brown featured on Madden cover". ESPN. Retrieved July 21, 2018. ^ "'Dancing With the Stars' 2016: Season 22 Celebrity Cast Revealed Live on 'GMA'". ABC News. March 8, 2016. Retrieved March 8, 2016. ^ Donnelly, Jim (May 16, 2016). "DWTS 2016 Results: Wanya Morris and Antonio Brown Eliminated!". ABC. Retrieved February 26, 2018. Wikimedia Commons has media related to Antonio Brown.